It might seem from some of my recipe posts that we eat a lot of meat – we don’t. Actually we mainly eat vegetarian and vegan food. During the week we often eat our favourite staples, mee goreng, black pepper tofu, peanut butter and cabbage noodles (more of this when we finally have cabbages), pasta, fritters, roast vegetables and curries of various sorts. This is partly an ethical decision and partly habit. I was vegetarian for a long time and I am just used to eating vegetarian food + of course I like it. Being close to the death of our animals either by doing it ourselves or being at the abattoir also does make us appreciate its value so we tend to eat it sparingly. Anyway this past week we have again mainly been eating chard. I don’t actually find it that boring eating the same main vegetable for a block of time – it makes you be more inventive! One of our favourite staples is some form of thai green curry. I make the paste up in batches (it is quite generic and you can mess around with the proportions and ingredients to some degree) and then freeze. There are lots of ingredients, but they keep for ages in the fridge and it is all very easy to put together – it is an instant dinner for busy nights. I serve it on brown rice. Thai Green Curry – ingredients for the paste: fresh coriander, 2tbs of coriander seed and 2tbs cumin seed, juice of two limes, about 4 shallots or one onion, grated fresh ginger or galangal, couple of garlic cloves, 4 chillis or more depending on how hot you like it, lemon grass (fresh or from a jar). Fry the spice seeds in a pan then crush in a pestle and mortar. Add everything to a food-processor and blitz until it is mush. Divide into little pots about two tbs per portion. 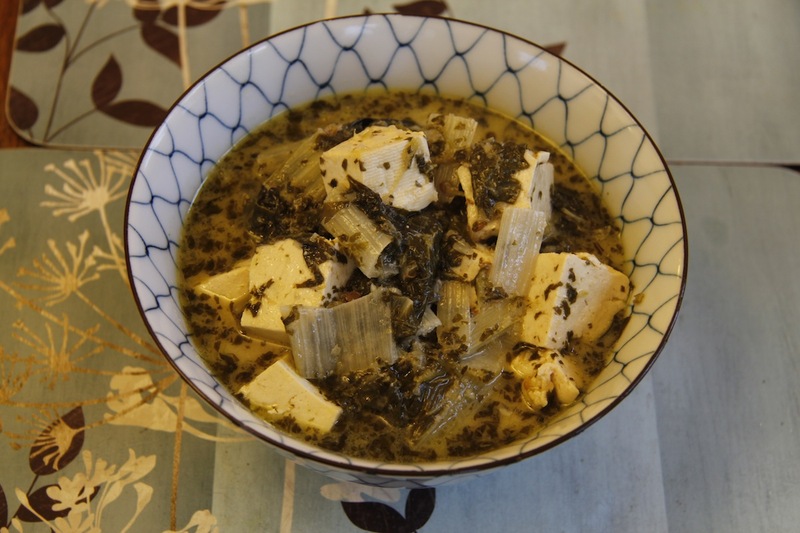 For the curry: block of firm tofu, swiss chard, some thai green curry paste (see above), half a tsp palm sugar, thai fish sauce, lime juice, tsp lemon grass, tsp galangal, tin of coconut milk, small bit of shrimp paste. Cut the tofu into cubes. Put everything apart from the fish sauce, lime and tofu in a saucepan. 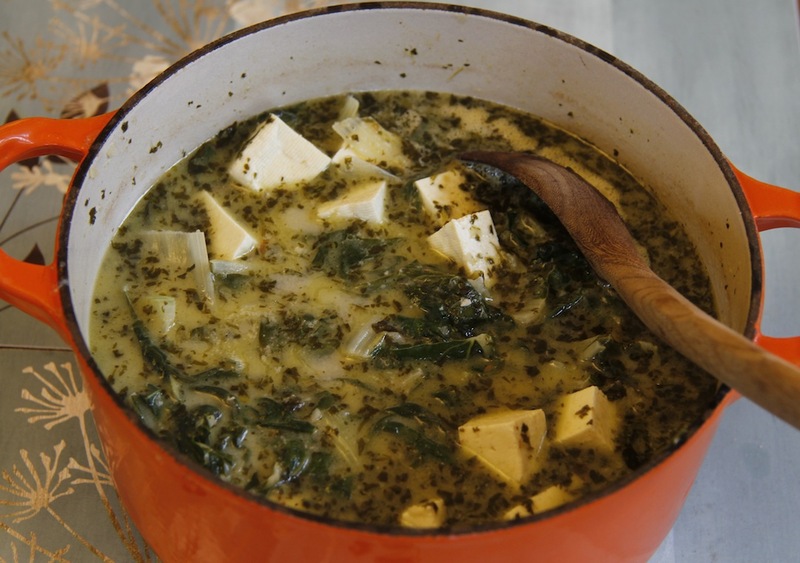 Heat up and simmer until the chard is cooked. Add the tofu and cook a little longer. Add fish sauce and lime juice to taste. Sometimes we add lime leaves as well. 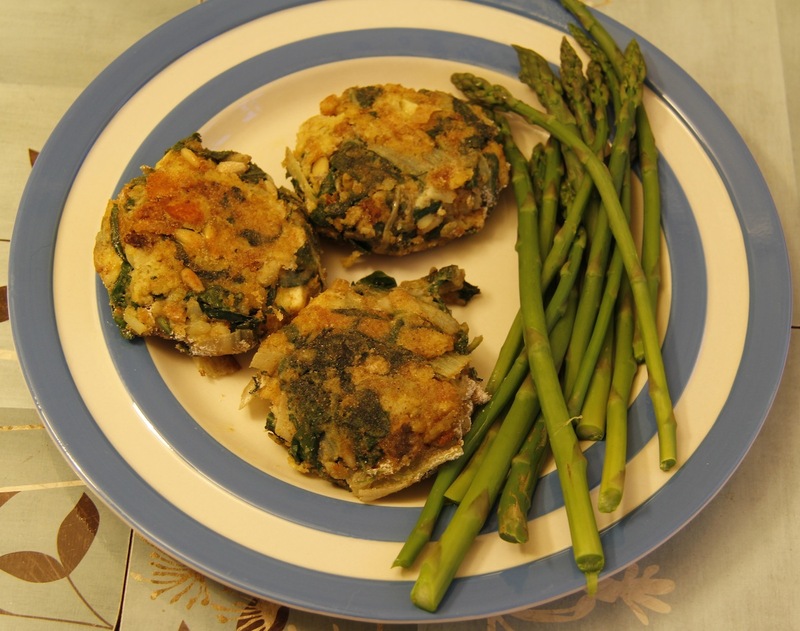 The next day we had swiss chard fritters using up leftover bits and pieces from the fridge – fritters are very good for this: swiss chard, eggs, grated leftover potato, breadcrumbs, leftover caerphilly and stawley goats cheese, flour for coating the fritters. 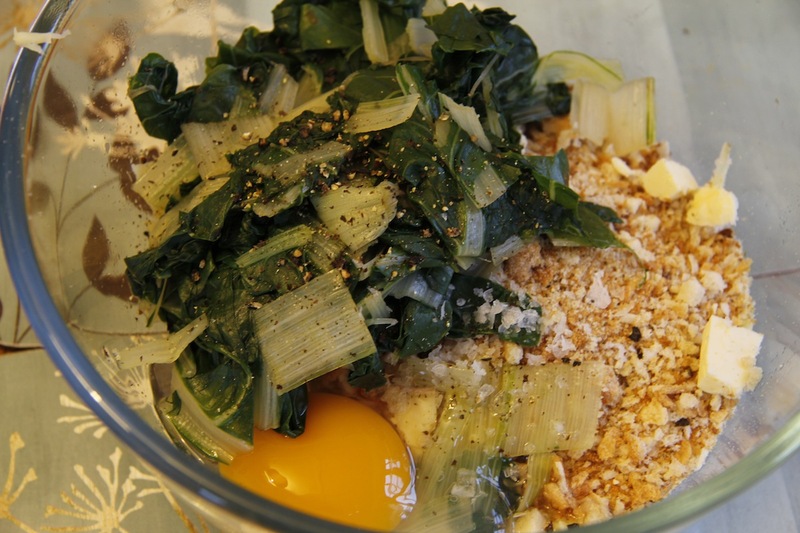 Chop and cook chard – mix everything together in a bowl and season with salt and pepper. I think I added parsley as well. Shape into fritters, roll in flour and pop in the fridge for a while to firm up. When you are ready for your dinner. Fry the fritters in some oil in a frying pan and serve with yoghurt and in our case with asparagus. Good grief, you seem to spend so much time in the kitchen. Wish I liked all things food – planning, preparing, all the creative bits of it – as you. Definitely would make my world a happier place. Do enjoy your tales of all things kitchen and food. Perhaps one day I will step in to the fun and mystery of the world of food and try some of your amazing recipes. Thanks, Claire for all you share with us out here.